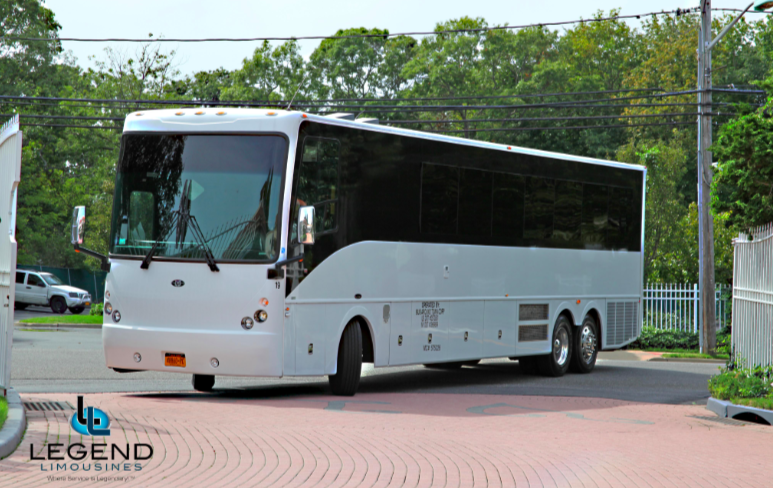 One of Legend’s newest buses, the Black and White 46 Passenger Limo Bus is one of the most impressive vehicles to hit the road anywhere. Comfortably seating 42-45 people, the Black and White exterior makes it an ideal choice for large Wedding parties as well as Corporate functions. The paint is mostly white in color, with black that goes from the top of the bus to about half way down the sides. The frameless windows are tinted and give the side profile of the bus an ultra-sleek design. Xenon headlights and Ultra-Bright fog lights complete the nose of the bus. Polished aluminum wheels show a mirror-like reflection. Under Belly Luggage compartments will hold luggage for 35-45 people (depending upon sizes of bags). Regardless of occasion, this bus comes with a host or hostess that will work all of the many interior features. The three-tone seats are black outside, with dark grey outline and light silver diamond pattern inserts. Black wood flooring makes the interior feel very modern. The stainless steel dance pole towards the rear of the bus is easily removable upon client request (with at least 24hrs advance notice). Two large coolers towards the rear hold enough soda and bottled water for every guest. The host station with all the lighting, climate, and entertainment controls features a working sink with fresh water. Color changing lights in the stainless steel cieling, in all the bar areas, and underneath the seats are all coordinated to change color at the same time. These same lights can be fixed to stay white for a less partylike atmosphere, or any specific color for themed occasions. There is a 72″ television on the back wall, one 55″ television on each side of the bus, and a 27″ television on the front wall, totaling 4 televisions.